Readmission is a significant problem after both medical and surgical hospital stays. Recent policy changes that include substantial financial penalties have made readmission an important, if not the most critical, pay-for-performance program for health care in the United States. Even people who undergo surgery on an outpatient basis can have postoperative complications that require hospital admission. One way to reduce these unfortunate outcomes is to ensure that patients receive consistent, high-quality care in the days and weeks following surgery by leveraging telemedicine. Video visits lessen the burden on patients and allow providers to schedule more frequent visits if necessary, and to connect with more patients each day. One example of an innovative new approach to postoperative care is Michigan Medicine’s Surgery eClinic program that was launched in 2017 and is now widely used in the hospital system’s gastroenterology, urology, and general surgery divisions. Rather than coming into the office, which can be painful and difficult for patients still in recovery, or expensive for those who have gone back to work, patients schedule an online, internet-based video chat with their clinician. Vahagn Nikolian, M.D., a general surgery resident at Michigan Medicine explained that efficiency is one of the primary goals for the program. “By seeing our uncomplicated patients in a more efficient manner, we can dedicate the limited in-person clinic time to more complex cases and new patient referrals,” he said. One of the reasons that telemedicine is becoming so popular for postop care is improved access to high-speed internet connections and mobile devices with high-definition video capabilities. In the early days of telehealth, remote visits required specialized equipment and training. That’s why it was primarily used when the patient was at a hospital or medical office with a clinician, and the advice of a specialist at a distant was needed. But these days, a considerable portion of the population has all of the technology they need on their desk or in their pocket. Telemedicine software has also advanced so that it is now as easy to use as the consumer applications that people use every day. Of course, solutions used for telemedicine must be designed with HIPAA compliance and patient privacy in mind. Reimbursement: Getting paid for each encounter is obviously an important consideration for providers. Unfortunately, Medicare does not pay for most video visits, although pressure is on the agency to evolve its policies. 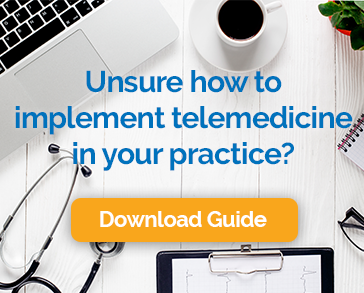 The good news is that many states recognize the value of telemedicine and have mandated that payers reimburse for this type of care, often at the same rate as an in-person visit. In fact, because most insurers don’t pay for phone calls, a pre-operative consultation done via video instead can actually increase practice revenue. Because payer policies and state laws vary, it is a good idea to invest in a telehealth solution that does payment verification at the time the visit is scheduled. Adoption: Telemedicine will only reduce the burden on patients and providers if both adopt it. From the provider side, this means a well-administrated program and one, like Michigan’s, that has buy-in from every level of the organization. Patients need education about the program, reassurance that it will be safe and effective, and details about what they can expect during each encounter. The postop recovery period is a crucial one for patients. How well they follow instructions, how well their medications are managed, and how engaged they feel in the provider/patient relationship will all determine the long-term outcome of the surgery. Telemedicine is a safe and convenient option for patients and potentially a gamer changer for hospitals and surgical centers.